Reye's syndrome is a rare but potentially fatal disease that particularly affects the brain and liver and mainly strikes children and adolescents after they have had a viral illness, such as chickenpox, influenza, or a cold. Although the cause is unknown, there is an association with the use of aspirin or other salicylates for treatment of the symptoms of the viral infection. This is a disease primarily impacting the young. The most common age diagnosed with Reye's syndrome in the United States is six to eight years, and the syndrome is extremely rare in individuals over the age of 18 (Carson-DeWitt 2005). With Reye's syndrome, the normal remarkable coordination of body systems is impacted. This illness may cause numerous detrimental effects to many organs, but most seriously affects the brain and liver, and can lead to rapid development of severe neurological symptoms, making it a life-threatening emergency illness (Robinson 2004). The disease causes fatty liver with minimal inflammation, and severe encephalopathy (with swelling of the brain). The liver may become slightly enlarged and firm, and there is a change in the appearance of the kidneys (Suchy et al. 2007). Reye's syndrome is rare, with incidents in the United States peaking in 1980 with 555 cases reported (Robinson 2004), but down to fewer than 20 cases annually since the late 1980s when concern regarding the use of aspirin was widely reported (Carson-DeWitt 2005). However, Reye's syndrome remains very serious, with a mortality rate of over 30 percent and historically as high as 60 percent. But with early diagnosis, the likelihood of recovery rises dramatically (Robinson 2004). The association of the disease with the use of aspirin has lead to the recommendation that aspirin not be used for fever in children or adolescents. This serious illness is referred to as a “syndrome” because the clinical features that physicians use to diagnose it are quite broad. Reye's syndrome results in fatty accumulation in the liver and other organs of the body, and causes edema (fluid accumulation) in the brain and a subsequent rise in intracranial pressure (Robinson 2004). The fatty deposits in the liver interfere with liver function, and intercranial pressure can result in constricting of blood vessels and reduction in blood flow to the brain and potentially brain damage (Robinson 2004). Although the cause remains unknown, the serious symptoms of Reye's syndrome appear to result from damage to cellular mitochondria, at least in the liver. This condition typically does occur after a fever-causing, viral illness, commonly of the upper respiratory tract. And there appears to be an association with aspirin. There are a number of ways that aspirin could cause or exacerbate mitochondrial damage. An increased risk of developing Reye's syndrome is one of the main reasons that aspirin has not been recommended for use in children and teenagers, the age group for which the risk of lasting serious effects is highest. Many studies have demonstrated a strong association between aspirin taken for viral illnesses and the development of Reye’s syndrome. Some have claimed that acetaminophen (paracetamol) is a greater risk, but the only study (Orlowski et al. 1987) to suggest this was too small and according to some sources, the conclusions by the authors seem flawed (Remington et al. 1988). The Centers for Disease Control and Prevention (CDC), the U.S. Surgeon General, the American Academy of Pediatrics (AAP), and the Food and Drug Administration (FDA) recommend that aspirin and combination products containing aspirin not be given to children under 19 years-of-age during episodes of fever-causing illnesses. Hence, in the United States, it is advised that the opinion of a doctor or pharmacist be obtained before anyone under 19 years-of-age is given any medication containing aspirin (also known on some medicine labels as acetylsalicylate, salicylate, acetylsalicylic acid, ASA, or salicylic acid). By comparison, current advice in the United Kingdom by the Committee on Safety of Medicines is that aspirin should not be given to those under the age of 16 years, unless specifically indicated in Kawasaki disease or prevention of blood clot formation (BMA 2007). However, although aspirin is a risk factor, and their is an association between viral infection and Reye's syndrome, the actual mechanism of the disorder has not been delineated. Additional associations also may be involved, such as exposure to pesticides or aflatoxin (Carson-DeWitt 2005). Symptoms of Reye's syndrome usually begin within a week or so from recovery from a viral illness. The earliest symptoms are persistent vomiting, which may be followed by lethargy, sleepiness, disorientation, agitation or combativeness. There may be quick progression, within hours, to more severe symptoms of seizures, coma, and stupor (Robinson 2004; Carson DeWitt 2005). Diarrhea may be more common in infants than vomiting (Robinson 2004). Reye's syndrome may be suspected if a child begins vomiting three to six days after a viral illness (Robinson 2004). There is no specific test, but blood tests can be done to determine the levels for certain liver enzymes, which will be elevated in the case of Reye's syndrome, and there may be other blood changes, such as increase in level of blood ammonia and amino acids, a drop in blood sugar, high blood acidity, and abnormalities in blood clotting (Robinson 2004; Carson-DeWitt 2005). A liver biopsy can be done (after correction of clotting abnormalities) and will reveal large amounts of fatty deposits in the liver in the cases of this disease (Robinson 2004; Carson DeWitt 2005). Reye's syndrome is often misdiagnosed as viral encephalitis, meningitis, diabetes, various inborn metabolic disorders, Drug overdose or poisoning, Head trauma, hepatic failure due to other causes, or renal failure. A lumbar puncture may be performed to rule other other possible causes (Robinson 2004). There is no cure, but this life-threatening emergency illness can have its various complications treated to try to prevent progression of the damage and permanent effects. Care is done in an intensive care unit. Among treatments used are intravenous sugar to restore normal levels, plasma transfusion and vitamin K use to improve clotting, and treatment of elevated intracranial pressure with intravenous mannitol and steroids (Robinson 2004; Carson-DeWitt 2005). Documented cases of Reye’s syndrome in adults have only been very rarely reported. The recovery of adults with the syndrome is generally complete, with liver and brain function returning to normal within two weeks of the illness. In children however, mild to severe permanent brain damage is possible, especially in infants. Over thirty percent of the cases reported in the United States from 1981 through 1997 died. However, with early diagnosis and treatment, the likelihood of recovery increases to 90 percent (Robinson 2004). Almost all children who do survive Reye's syndrome recovery fully although some patients may experience permanent neurological damage (Robinson 2004). Reye’s syndrome occurs almost exclusively in children, and while a few rare adult cases reported over the years, adult cases do not typically show permanent neural or liver damage. Unlike in the United Kingdom, the surveillance for Reye’s syndrome in the United States is focused on patients under 18 years-of-age. In 1980, after Centers for Disease Control and Prevention (CDC) in the United States began cautioning physicians and parents about the association between Reye’s syndrome and the use of salicylates in children with chickenpox or virus-like illnesses, the incidence of Reye's syndrome in the United States began to decline. In the United States between 1980 and 1997, the number of reported cases of Reye’s syndrome decreased from 555 cases in 1980 to about two cases per year since 1994. During this time period, 93 percent of reported cases for which racial data were available occurred in whites and the median age was six years. A viral illness occurred in 93 percent of cases in the preceding three week period. For the period 1991-1994, the annual rate of hospitalizations due to Reye’s syndrome in the United States was estimated to be between 0.2 and 1.1 per million population less than 18 years-of-age. During the 1980s, a case-control study carried out in the United Kingdom also demonstrated an association between Reye’s syndrome and aspirin exposure (Hall et al. 1988). In June 1986, the United Kingdom Committee on Safety of Medicines issued warnings against the use of aspirin in children under 12 years-of-age and warning labels on aspirin-containing medications were introduced. UK surveillance for Reye’s syndrome documented a decline in the incidence of the illness after 1986. The reported incidence rate of Reye’s syndrome decreased from a high of 0.63 per 100,000 population less than 12 years-of-age in 1983/1984 to 0.11 in 1990/1991. From November 1995 to November 1996 in France, a national survey of pediatric departments for children under 15 years-of-age with unexplained encephalopathy and a threefold (or greater) increase in serum aminotransferase and/or ammonia led to the identification of nine definite cases of Reye’s syndrome (0.79 cases per million children). Eight of the nine children with Reye’s syndrome were found to have been exposed to aspirin. In part because of this survey result, the French Medicines Agency reinforced the international attention to the relationship between aspirin and Reye’s syndrome by issuing its own public and professional warnings about this relationship (Autret-Leca et al. 2001). The syndrome is named after Dr R. Douglas Reye, who, along with fellow Australians Dr. Graeme Morgan and Dr. Jim Baral, published the first study of the syndrome in 1963 in the The Lancet (Reye et al. 1963). In retrospect, the occurrence of the syndrome may have first been reported in 1929. Also in 1964, Dr. George Johnson and colleagues published an investigation of an outbreak of influenza B that described 16 children who developed neurological problems, four of whom had a remarkably similar profile to Reye’s syndrome. Some investigators refer to this disorder as Reye-Johnson syndrome, although it is more commonly called Reye's syndrome. During the late 1970s and early 1980s, studies in Ohio, Michigan, and Arizona (Mortimor et al. 1980) pointed to the use of aspirin during an upper respiratory tract or chickenpox infection as a possible trigger of the syndrome. Beginning in 1980, the CDC cautioned physicians and parents about the association between Reye’s syndrome and the use of salicylates in children and teenagers with chickenpox or virus-like illnesses. In 1982, the U.S. Surgeon General issued an advisory and in 1986 the Food and Drug Administration required a Reye’s syndrome-related warning label for all aspirin-containing medications. Arrowsmith, J. B., D. L. Kennedy, J. N. Kuritsky, and G. A. Faich. 1987. National patterns of aspirin use and Reye syndrome reporting, United States, 1980 to 1985. Pediatrics 79: 858-863. Autret-Leca, E, A. P. Jonville-Bera, M. E. Llau, et al. 2001. Incidence of Reye’s syndrome in France: A hospital-based survey. Journal of Clinical Epidemiology 54: 857-862. PMID 11470397. Retrieved August 31, 2008. Belay, E. D., J. S. Bresee, R. C. Holman, et al. 1999. Reye’s syndrome in the United States from 1981 through 1997. NEJM 340(18): 1377-1382. British Medical Association (BMA) and Royal Pharmaceutical Society of Great Britain. 2007. 2.9 Antiplatelet drugs. Page 151 in British National Formulary for Children. London : BMJ Publishing. ISBN 9780853697411. Carson-DeWitt, R. 2005. Reye syndrom. In S. L. Chamberlin, and B. Narins, eds., The Gale Encyclopedia of Neurological Disorders. Detroit: Thomson Gale. ISBN 078769150X. Food and Drug Administration (FDA), United States. 2003. 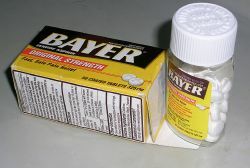 Labeling for oral and rectal over-the-counter drug products containing aspirin and nonaspirin salicylates; Reye’s syndrome warning, Final Rule. Federal Register 68 (April 17, 2003):18861-18869. Forsyth, B. W., R. I. Horwitz, D. Acampora, et al. 1989. New epidemiologic evidence confirming that bias does not explain the aspirin/Reye’s syndrome association. JAMA 261: 2517-2524. Hall, S.M., P. A. Plaster, J. F. T. Glasgow, and P. Hancock. 1988. Preadmission antipyretics in Reye’s syndrome. Arch Dis Child 63: 857-866. PMID 3415311. Retrieved August 31, 2008. Hurwitz, E. S., M. J. Barrett, D. Bergman, et al. 1987. Public Health Service study of Reye’s syndrome and medications: Report of the main study. JAMA 257: 1905-1911. Johnson, G. M., T. D. Scurletis, and N. B. Carroll. 1963. A study of sixteen fatal cases of encephalitis-like disease in North Carolina children. N C Med J 24: 464-73. Mortimer, E. A. 1987. Reye’s syndrome, salicylates, epidemiology, and public health policy. JAMA 257(14): 1941. Mortimor, E. A., 1980. Reye Syndrome: Ohio, Michigan. Morbidity and Mortality Weekly Report 29: 532. Orlowski, J. P., J. Gillis, and H. A. Kilham. 1987. A catch in the Reye. Pediatrics 80(5): 638-642. Retrieved August 31, 2008. Remingon, P. L., K. Sullivan, and J. S. Marks. 1988. A catch in "A Catch in the Reye." Pediatrics 82: 676-677. Reye, R. D. K., G. Morgan, and J. Basal. 1963. Encephalopathy and fatty degeneration of the viscera. A disease entity in childhood. Lancet 2:749-52. PMID 14055046. Retrieved August 31, 2008. Robinson, R. 2004. Rey's syndrome. Pages 2895-2896 in in J. L. Longe, The Gale Encyclopedia of Medicine, 2nd edition, volume 4. Detroit, MI: Gale Group/Thomson Learning. ISBN 0787654930 (volume). ISBN 0787654892 (set). Starko, K. M., C. G. Ray, L. B. Dominguez, et al. 1980. Reye's Syndrome and salicylate use. Pediatrics 66: 859-864. Retrieved August 31, 2008. Suchy, F., R. J. Sokol, and W. F. Balistreri. (Eds.) 2007. Liver Disease in Children. Cambridge: Cambridge University Press. ISBN 0521856574. Sullivan, K. M., E. D. Belay, R. E. Durbin, et al. 2000. Epidemiology of Reye’s syndrome, United States, 1991-1994: Comparison of CDC surveillance and hospital admission data. Neruoepidemiology 19: 338-344. Surgeon General’s advisory on the use of salicylates and Reye syndrome. 1982. MMWR Morb Mortal Wkly Rep 31: 289-90. This page was last modified on 13 August 2015, at 15:00.